For over 25 years, I have worked in Information Technology, where “knowing” is treated like everything. Knowing system specifications off the top of your head; knowing arcane commands along with all the variations of sub-commands by heart; knowing every computer system in a company, along with how they all work together. This emphasis on knowing, while being laudable in many regards, has also lead to an extremely disheartening behavior: Nerd Strutting. Why am I discussing this here? Because I also interact with in another environment where knowing is extremely important: Judaism. Whether it is the Torah portion of the week, a bit of talmud relating to business dealings, digging into deep thoughts out of Mishna such as the quote at the top of this post, or researching the historical basis for various traditions, Jews of all stripes can be found engaging in life-long learning. The emphasis on knowing in this context may be even more intense than in I.T. – not only the ability to recite from memory huge chunks of text, but knowing references from one body of work to another, across vast (and often rambling) subject matter. Plus there’s the whole fact that this information may be presented in English, Aramaic, or Hebrew – ancient, medieval, or modern. One of the more remarkable aspects of all this is that, despite the ferocious pursuit of knowledge, all teachers are welcome. I have watched a teenage present his newest discovery – a piece of text he had just learned in school – to a group of adults who had surely studied it several times, and even taught it themselves. But the room was nothing except respectful, supportive, interested, and engaged. I have watched seasoned teachers insist – with absolute sincerity – that they learn more than their students each time they offer a class. These are not isolated incidents or examples of a group humoring an eager learner (or an over-indulgent parent). This happens all the time, in every city. 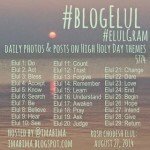 During Elul, many people find the drive to share what they know (including those of us participating in BlogElul!) It might be tempting to fall into the trap of shutting out all these voices, believing we have heard it before or that our knowledge is somehow more valid. We should instead take the opportunity to learn from everyone, in the hope that we are shown the same level of support as we stand before the One who truly knows all.